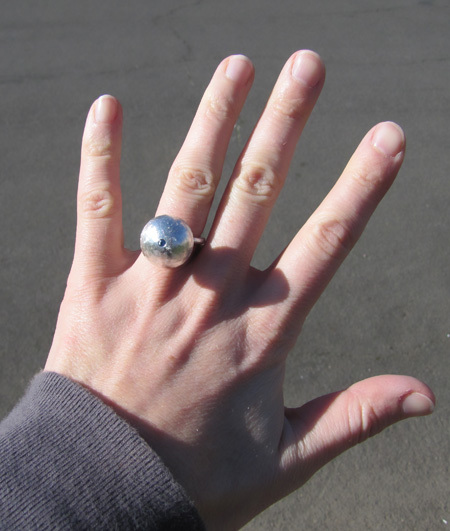 The first of the Bauble Rings. 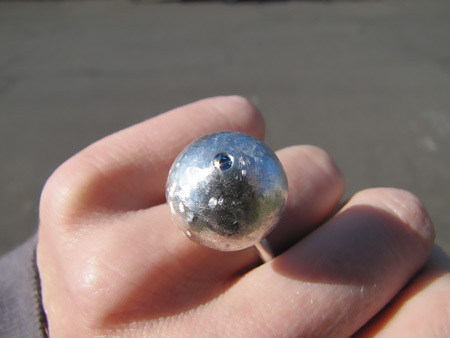 I constructed this out of sterling and set a tiny 2.3mm sapphire in the top. The ball measures just under 3/4 inch. I snapped a few photos out in the brilliant sun. It has been beautiful here in Portland these past few days; the sky has been deep blue, crocuses are blooming, there are tiny pink flowers sprouting from all the plum trees. It’s deceptively cold though and every time we take off for a leisurely walk, we come back with blue lips. This is another one. 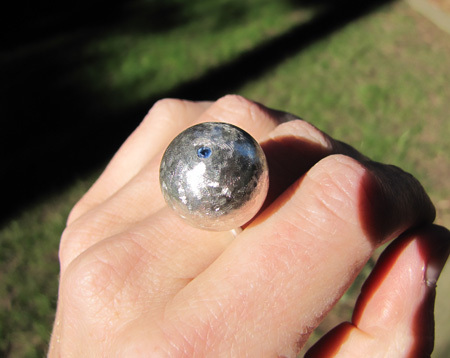 The ball is more perfectly spherical and a little bigger too, a tad over 3/4 inch. 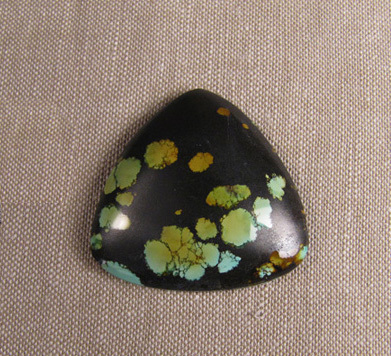 When I found The Guy With The Turquoise at AGTA I totally started vibrating, I was so excited. I probably spent an hour poring over every stone even though I ended up buying the three papers I picked up initially. I ended up with 100 grams of turquoise. That piece up above is so cool I had to get it. It’s going to be a monster ring, most likely; that thing’s easily the size of a peanut butter cup. It looks like some sort of infrared Japanese water lily pond. My mom came in for the spectacle the first day and we met up with Alisha. We all sort of drifted from one huge fancy color diamond booth to another for a while before shaking our heads and trying to remember what we came for in the first place. The AGTA show is so freaking huge it’s hard to know where to start. Winding down on the last day of the show. Note the strict business casual dress code. I was in jeans and looked more presentable than most of the buyers. I guess the suits come for the first few days of the show only. I come for the sales on the last day. A godawful waste of pearls if you ask me. 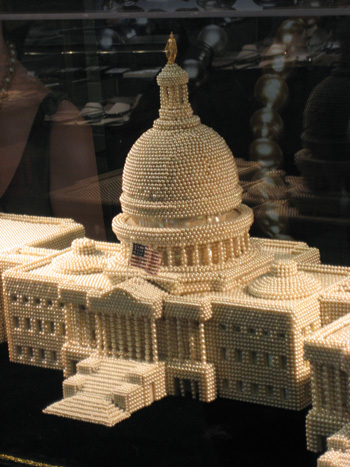 The lady went on about how long it took them to find so many matching pearls to build this wondrous monstrosity. Aaahh, that’s much easier on the eyes. 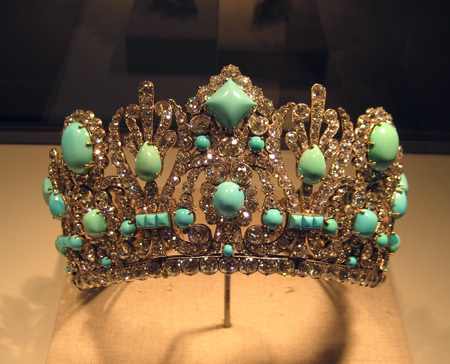 This is Empress Marie-Louise’s tiara. Originally it had emeralds instead of turquoises but it was purchased by Van Cleef & Arpels in the 50s, they removed all the emeralds, and had them replaced with Persian turquoise. The emeralds they reset in modern-style jewelry and sold off as pricey little nuggets of Napoleonic history. I find it interesting that the turquoises are really unmatched in color. I wonder if it was always so or if some of them turned more greenish over time. Some of the booth folk were not interested in me taking photos of their stock (corporate spies are everywhere) but these guys didn’t care. 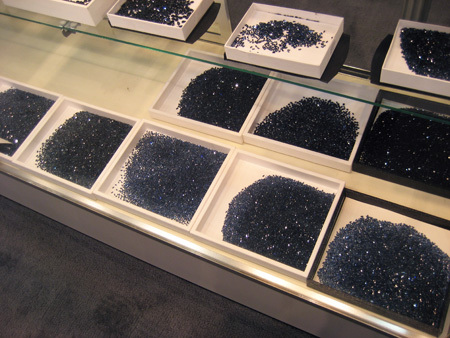 Here are many many sparkling sapphires. There was a LOT of this sort of thing going around. As the show neared the end, vendors were either brain dead or really chatty about their stock to people clearly not buying $13,000 stones. This guys brought some of his trapiche emeralds out for us to ogle. They are just so damned cool. 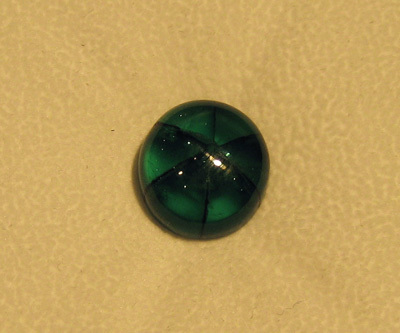 Really intense green and so much clearer than you usually see emeralds. The gem show is in Tucson so we stayed at my parent’s house out in the desert near Rio Rico. I snapped the obligatory out-the-car-window shot of the ominous clouds. Joshua stopped the car for me here. The cloud shadows on the dusty mountains looked really cool. 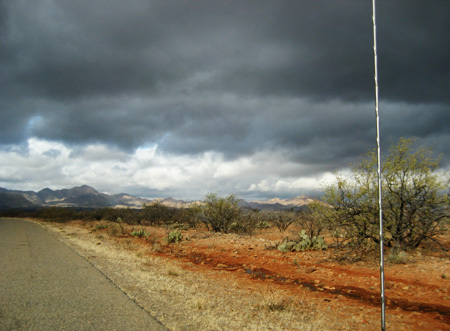 It started raining as we drove in to Tucson. Since we’re big tough Pacific Northwest types, we walked in the rain in between venues (along with nobody else). I was amused to see this skate park built in the concrete drainage ditch. 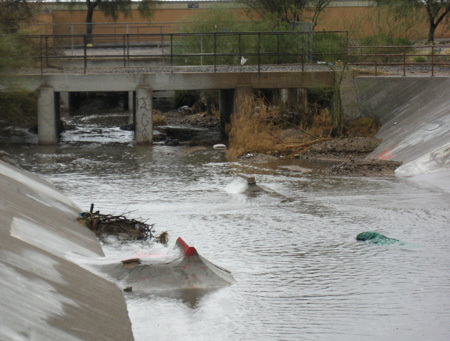 This is right near the Convention Center. Go skater punks! 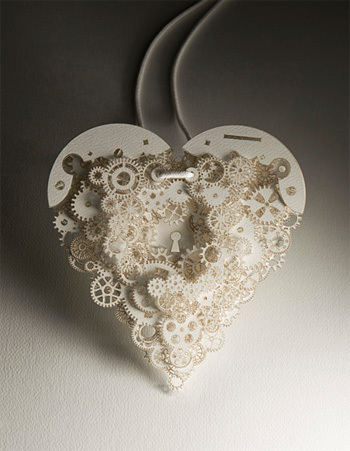 I don’t often get into heart or gear jewelry. 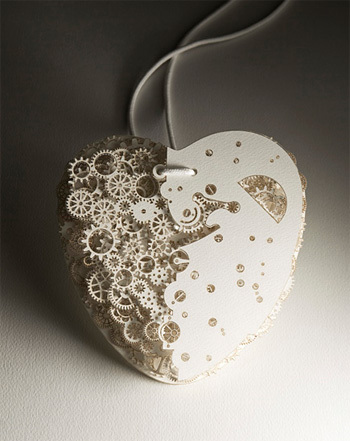 Heart jewelry is usually too sappy sentimental and gear jewelry generally attracts too predictable a crowd for my tastes. 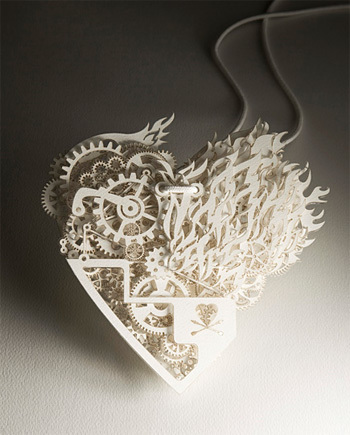 The combination of hearts and gears, however, cancel out the sap/dork and make for some pretty damned awesome pieces. They are made by a design house called Tjep that does everything from product design and packaging to interiors and building design. It’s all pretty decent looking stuff really, rather heavy handed on the laser cutting. Her other stuff is even cooler. 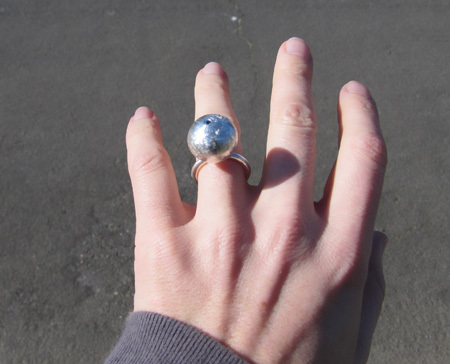 New ring in the shop! 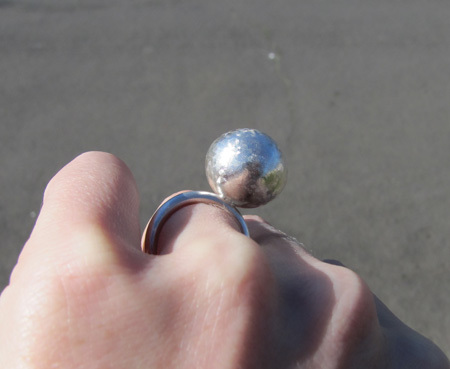 It’s made from three plates of silver riveted together (no solder at all). 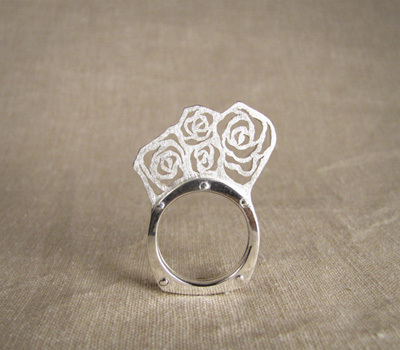 It looks awesome when the sun shines through it; it makes little rose shadows on your hand. In other news, I’ll be going to the Tucson Gem Show in a couple of days. 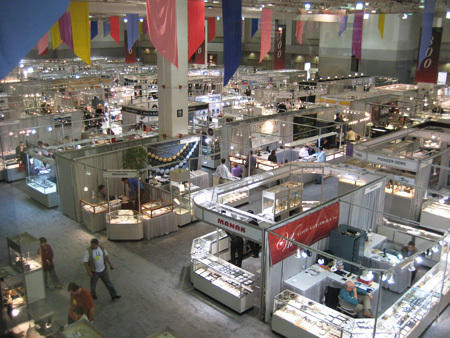 It’s the largest gem show in the country, in the world possibly? 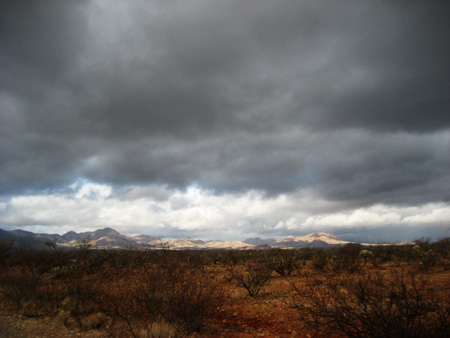 At any rate, it is massive; the entire town of Tucson is descended upon and taken over by gem, rock, and fossil types. There are venues set up all over town, some typical convention-hall places or large temporary tents set up for the occasion but others are in various motels. The string of motels along I-10 transform into a crazy marketplace; people vending out of their rooms. You wander the halls, going into any open door. Beds are shoved up against the walls and folding tables are set up with lights and glass cases for the stones. You can see into the bathroom nook where there are always personal effects like coffee cups, makeup bags, electric shavers, toothbrushes, rumpled washcloths or towels sitting out. I always feel awkward when I see such things because I remember that they have been living in this room for the past week. They actually sleep in the bed underneath the table. 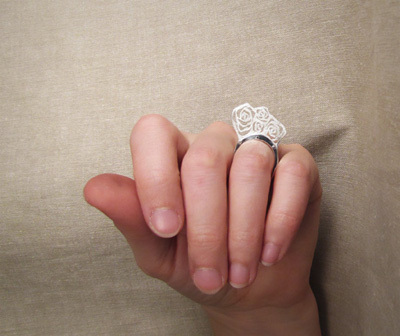 The goods range from dusty rocks and fossils or mammoth tusks to fat glittering diamonds and sapphires and rubies. There are tables piled two feet high with hanks of pearls. Buckets (literally) of lower-quality cut sapphires, amethysts, garnets, citrines. Some venues are just in parking lots and others have security guards, only letting certified in-the-business folks inside. These venues actually have a dress code, a thing that totally freaks me out since I have very little in the way of non-denim and t-shirts. One of my favorite stops is the Flamingo Hotel lounge downtown where the Native Americans show their work. This is not so much a rock venue but rather a finished jewelry and artwork show. You walk into the hotel lobby and the light is dim, there are smudge bundles burning, wooden flute broken up with an eagle call here and there is playing in the background, and a bunch of surly old dudes loaded down with serious turquoise jewelry stand over their work. 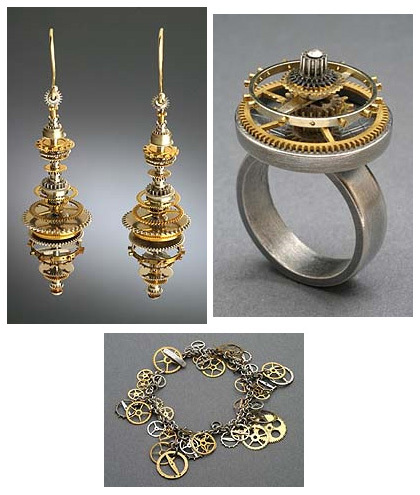 A lot of the jewelry isn’t really my style but some is truly awesome. It’s always worth checking out.